» Past Events Ride South L.A.
For upcoming events see our current status or schedule pages. Below is a somewhat incomplete archive of past events — still, good to have somewhere that they’re listed! 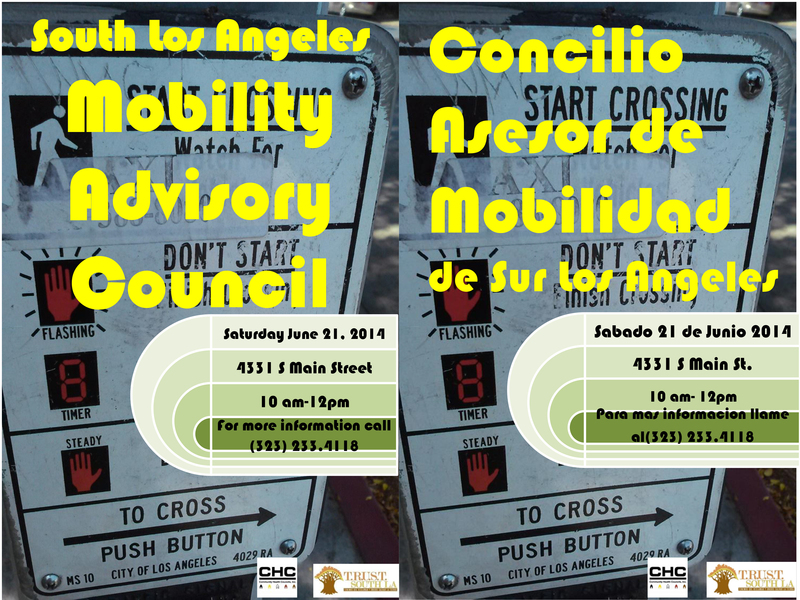 June 21, 2014 Mobility Advisory Council will convene to discuss issues and solutions for making South LA more mobile. Please join the group from 10am-12pm at 4331 S. Main St. Los Angeles CA 90037. 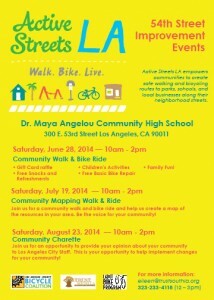 June 28th, 2014 Active Streets LA will be hosting a community walk and ride at Dr. Maya Angelou Community High School from 10am-2pm. lOCATION: 300 E. 53RD St. Los Angeles ca 90011. Free giveaways and family fun! 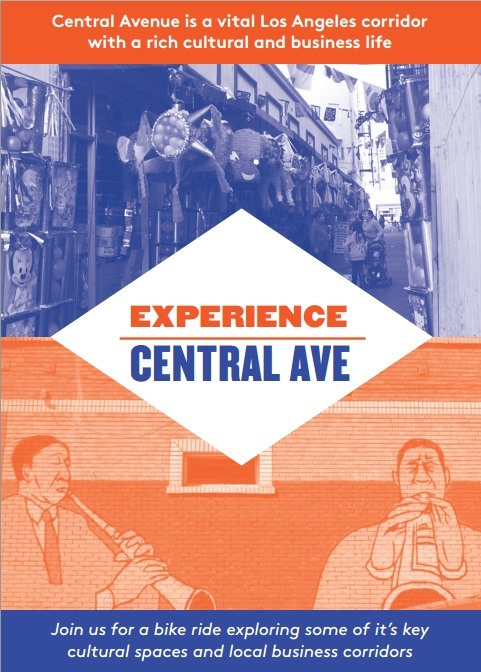 May 17, 2014 Join us for a day of exploration as we help build a map of community assets in some of Central Avenue’s key cultural spaces and local businesses. The event will take place from 10am-2pm. We will meet at the Central Ave Jazz Park on 42nd Pl. 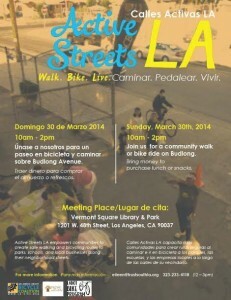 and Central Ave.
March 30, 2014 Active Streets LA: Walk and ride! 10am-2pm. 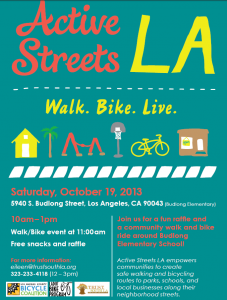 Join us at this community Walk and Ride! We will we walking, riding, and creating a community map! The ride will begin at the Vermont Square Library and go North, the walk will also begin at the library and go South! The library is located at 1201 W. 48th St Los Angeles CA 90037. CLICK HERE for the Facebook page. Bring money for snacks and lunch. See you there! 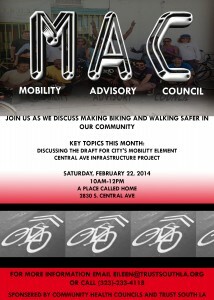 Saturday, February 22: South Los Angeles Mobility Advisor Council will be held at 2014 at 2830 S Central Ave, Los Angeles, CA 90011 (A Place Called Home) from 10am-12pm. We will be discussing the Draft for City’s Mobility Element and the Central Ave Infrastructure Project. 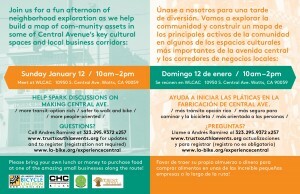 Contact eileen@TrustSouthLA.org for more information. Wednesday, February 26: Rail to River Study Briefing Meeting from 4pm-6pm. The meeting will be held at Los Angeles Academy Middle School Multi-purpose room, 644 E 56th. St. Loas Angeles CA 90011. Metro leads the conversation regarding a feasibility study for non-motorized transportation along the Slauson Ave. Corridor. 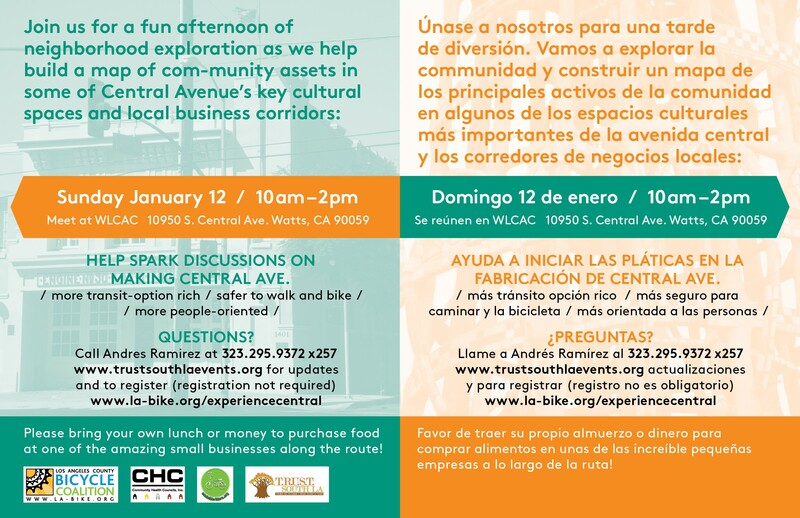 January 12, 2014: Experience Central Ave Mapping Ride. Check out the FACEBOOK PAGE! 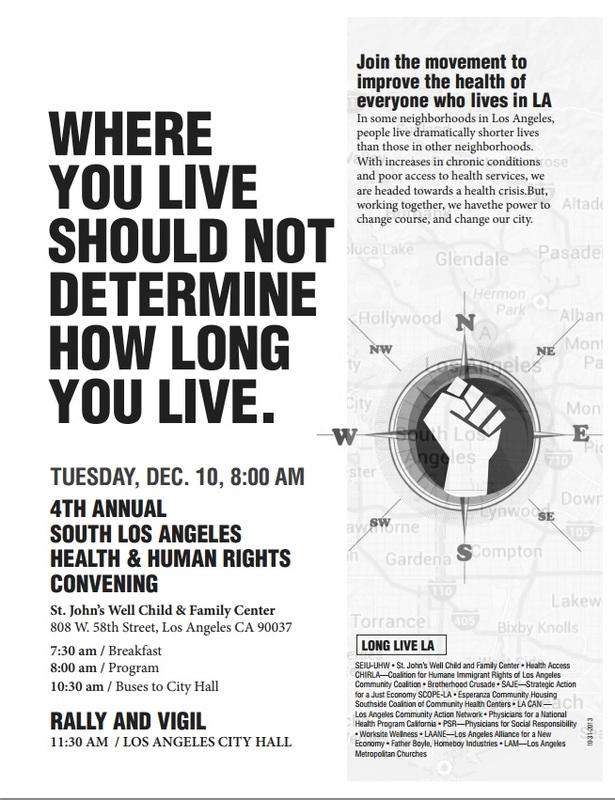 December 10, 2013: 4TH ANNUAL SOUTH LOS ANGELES HEALTH & HUMAN RIGHTS CONVENING. Check out the FACEBOOK PAGE! In Oakland on November 9 and 10 we will be presenting at the California by Bike Summit — check out our two sessions! November 3, 2013 Experience Central Ave. bike ride exploring some on Central Ave’s Key cultural spaces and Local business corridors. Help Spark discussions making central more transit option rich, safer to walk and bike, and more people oriented.CLICK HERE for more information. October 27, 2013 The Mobility Advisory Council is geared towards improving pedestrian and biking infrastructures throughout South Los Angeles. 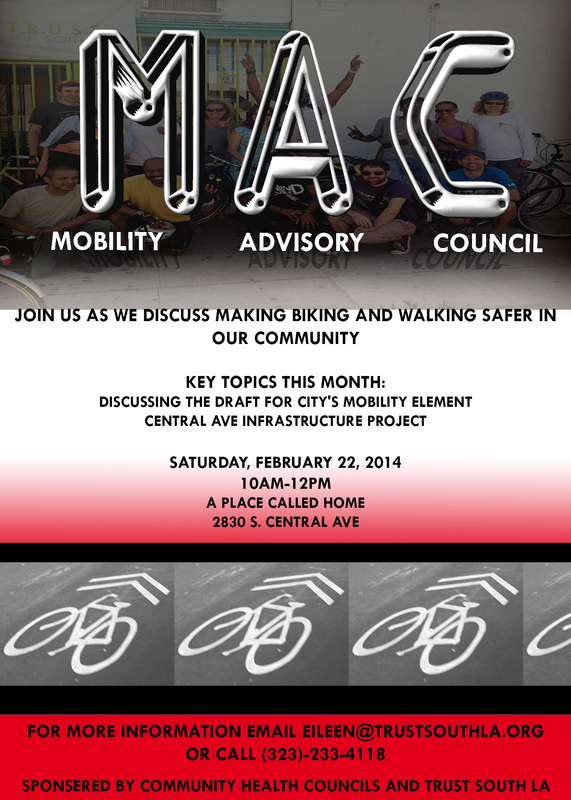 Please join us as we discuss ways to improve Mobility and Recreation in our community. CLICK HERE for more information. October 27, 2013 Ride to Leimert Park from Central Ave. CLICK HERE for more information. 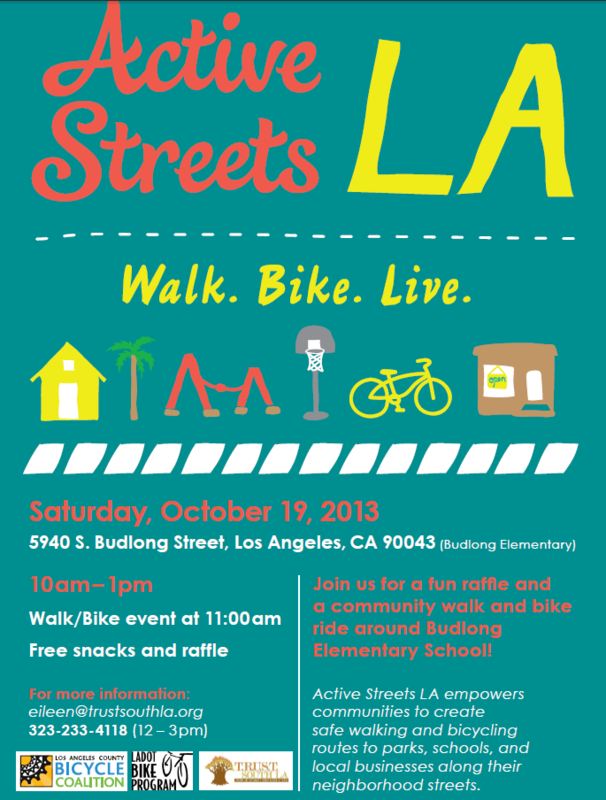 October 19, 2013 This event will feature FREE gift card raffle, FREE Family activities, FREE snacks and beverages, and a bike ride/walk. The event begins at 10am. For more information CLICK HERE! October 6, 2013 CicLavia Feeder ride. 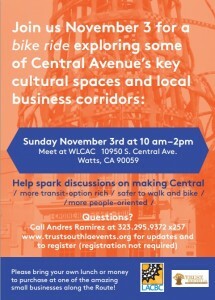 Click HERE for more information oN riding out from Central Ave! July 28, 2013 East Side Riders BC is hosting Watts Ride 2013. 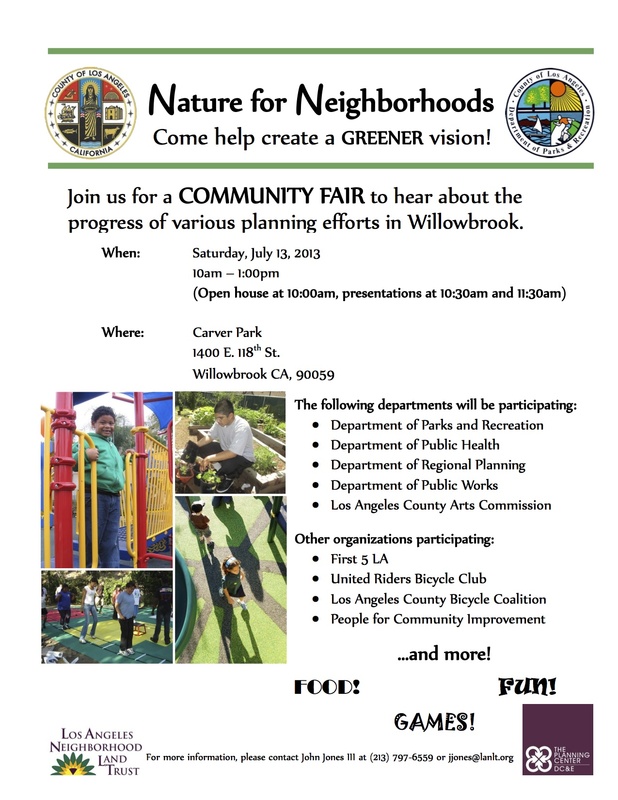 The ride will begin at 10am at Augusta Hawkins Nature PArk near Compton Ave. and Slauson Ave.
July 13, 2013 The Willowbrook community hosted a community fair at Carver Park, 1400 E. 118th St. Willowbrook CA, 90059. The event took place from 10am-1pm. 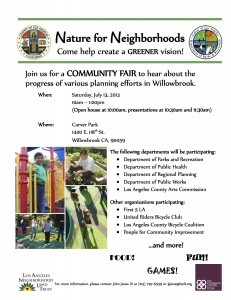 Come help create a GREENER vision! July 14, 2013 Black Kids on Bike and LACBC (Los Angeles County Bicycle Coalition) presents Melrose Art Ride from 2-6pm. Click here for more information! Or visit them on Facebook.June 29, 2013 Mobility Advisory Council is geared towards improving pedestrian and biking infrastructures throughout South Los Angeles. The meeting took place at 10:30AM to discuss ways to improve Mobility and Recreation in our community. The meeting location was the CHC office, 3731 Stocker St. Los Angeles CA, 9008. CLICK HERE for reservations! June 20, 2013 This Complete Streets Forum was set up in order to have a discussion about walkability, Safety, and Bikeability along Central Ave. We discussed the City’s proposals for bike lanes and streetscaping along Central Ave. The meeting location was, 2830 S Central Ave. Los Angeles, CA 90011, A Place Called Home’s office at 6pm. RSVP for future events HERE! June 23, 2013 CicLAvia feeder ride. 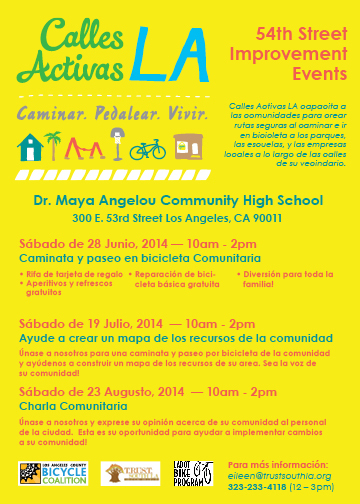 Individuals and groups from all over Los Angeles gathered in Leimert Park at 9am and rode as a group to CicLAvia. To RSVP for future events CLICK HERE and check out the Facebook page for pictures! 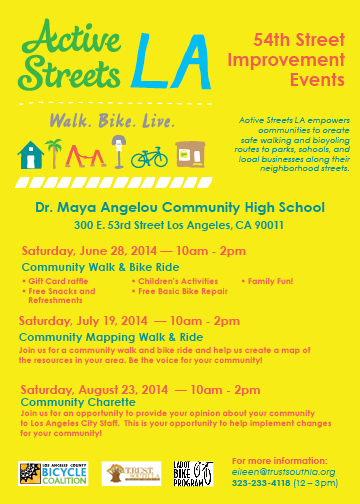 June 16, 2013 CHC and TRUST SOUTH LA hosted the Complete Streets Ride: Central Ave. Check out their Facebook for more information on the event CLICK HERE! 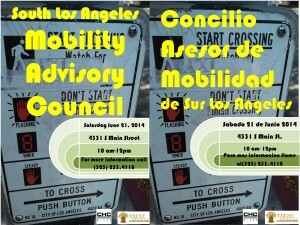 May 19, 2013 Mobility advisory Council from 10-11am. May 19, 2013 Complete Streets Ride 11am-3pm. The ride will be meeting at 4331 S. Main St. Los Angeles CA 90037.Check out the event on Facebook here! May 15, 2013 Ride of Silence. In Los Angeles CA from 7pm-10pm. Click here for more information. May 9, 2013 Complete Streets Forum will be convening from 6-8pm at 3731 Stocker St. Los Angeles CA 90008 (CHC office). April 21, 2013 The LA Real Rydaz and WARP presents: CicLAvia To The Sea feeder ride from South LA! This ride will be meeting at 7:30am and departing at 8:30am from Manchester/ Vermont in front of Payless shoes store. April 6, 2013 is Earth Day, and we will be celebrating the healthy food map, and doing a ride. For ride details see below. February 9, 2013 was the Ride for Love. 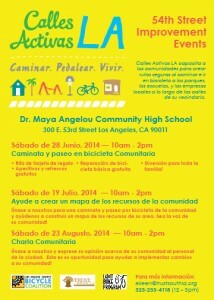 July 1, 2012: South LA Peace, Love and Family Ride & Fair, hosted by the Real Rydaz. See below for some photos. (See the Facebook event page.) Registration for the 10-mile group ride begins at 8:30 at Exposition Park (ride at 10:15am); registration for the 5-mile group ride starts from Manchester Square (8619 South Vermont Ave) when the 10-milers get there (around 11:00am). The riders then come back to Manchester Square for the fair. June 17, 2012: Return to the Map — for details see our Facebook event page — this will be our first group ride to follow our just-launched map Ride to Watts led by TRUST South LA. If it’s anything like our January ride, this will be a lot of fun, with people coming from all over the city. The current plan is to leave at 10am from Augustus Hawkins Natural Park. There is already some coverage of the event from Intersections S LA on 6-13. May 26, 2012: City Lites rides. These are 23-mile & 5-miles Bike Tours (as well as 5k-Walk, 5-mile Skateboard Ride, and a 5-mile Wheelchair Roll, Festival & Health Pavilion) that take off from Jesse Owens Park in South LA. For details, see the Facebook event page.